Western fashion spans more than the American old west. From the late 1700s, through all of the 1800s and 1900s, and into the 21st century, the American west has developed a unique style that remains firmly tied to the frontier and pioneer expansion westward across America. Early American western clothing, in the years prior to about 1830, was hardly fashion at all. It was practical. It had to be! The American frontier was open only to hunters, trappers, explorers, and traders. Early Americans traded more than wampum. We adopted Indian forms of clothing. Leather played a big part. Game was plentiful and cloth was scarce. 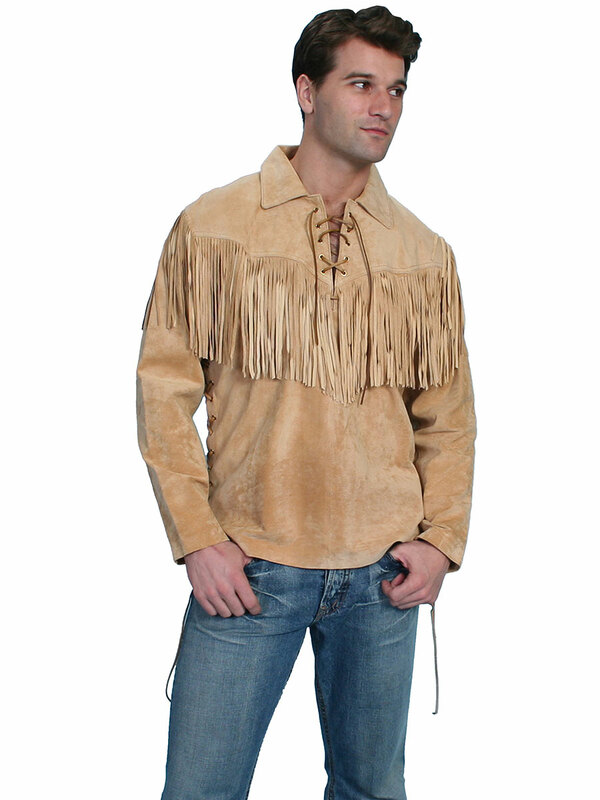 Buckskins, made from soft sueded deerskin, were often fringed and decorated with beads or animal teeth or bones. Much of American fashion in the 1800s was derived from European styles. In some cases our old west styles remained consistent with those of the Europeans. For example, a man’s frock coat in San Francisco in 1890 would have been cut exactly like one in London. Other styles evolved to fit life in the old west. With very few boardwalks and no paved roads, the need for extended protection drove styles toward work boots and riding boots. Even leisure class wore some form of boot for footwear in the American west. The dependence on horses in the frontier led to the development of Rifle Coats and Cowboy Dusters. Long length and ample cut were needed to protect people on horseback. Formal wear for men in 1850 included a collared shirt with tie, a formal tailed coat, tapered at the waist, with lapels, and a deep “V” buttoned front. Pant material matched the coat. Front leg crease broke on the shoes. Belts or suspenders and a vest completed the suit. Variations over the decades, across more than 150 years, have been surprisingly minor. Although fashion and style dictate that design details are changed every few years, the basic ensemble has remained structurally unchanged. The basics for western fashion evolved and remained popular over the next century. Even today, we see the evident lineage between 1850s fashions and modern wear. The 1800s is considered the classic age in clothing. Functionality and form finally came together to produce trends that endure today. In the late 20th century and on till the current day, the old west remains a strong influence, particularly on casual wear fashion. Especially in men’s formal wear and work clothing, we can see how the 1800s American west influenced what we wear in the 21st century. Women’s western clothing has taken on more ornamentation and been modified by experimental cuts and designs. But, the western influence is still strong. In women’s clothing, one mainstream lineage has melded nicely with western fashion. Hispanic designs and ornamentation have added variety and new lines to old west styles. Fringe, lace, bias cut hems, decorative stitching, beaded ornamentation, and metal buttons and adornments. Fashion1800 is the online source for western clothing, old west designs, frontier leathers, and contemporary western styles.